Groton's most celebrated heroine is Mother Bailey, whose famous flannel petticoat rocketed her to fame in 1813, making her the toast of the nation. "Born Anna Warner on October 11, 1758, in Groton, she was orphaned at an early age and went to live with kind grandmother Mills on a farm at Candlewood Hill, where she helped her uncle, Edward Mills, with the crops and animals. She was unusually tall and strong for a girl. When the Revolution began, she longed to fight the despised Tories. On September 6, 1781, when the British attacked Fort Griswold, her uncle Edward, a corporal in the militia, hurried to the fort, leaving behind his wife, a young son, and a very new baby. All day the sound of cannons reached Candlewood Hill and smoke rose from the battle and burning town. By night the guns were silent, but Edward did not return, and there was no news. At dawn Anna rose, milked the cows, and without breakfast, began the three-mile hike to find her uncle. She hurried barefoot down the lane to the highway (now Route 184) already crowded with worried relatives. She found Edward lying mortally wounded in the Avery house, weak from the loss of blood and sinking fast. He longed to see his family and begged his niece to bring them to him. Anna hurried back to the farm, saddled the old horse, helped up the young wife and older child, and carrying the baby herself, returned to place the infant in the arms of the dying man. After this, Anna Warner hated the British more than ever. 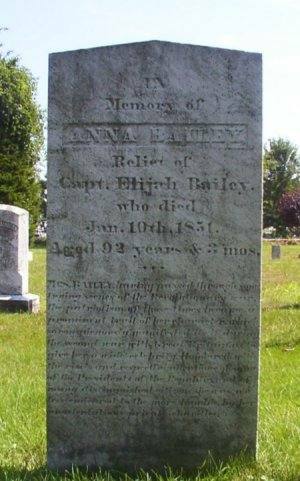 She married veteran soldier Elijah Bailey in 1783. About 1800 they went to inn-keeping on Thames Street below the fort where Mrs. Baileys' hearty manner and outspoken ways made the tavern popular from the start. The house still stands at the southwest corner of Thames and Broad street. When (President) Madison declared war on England in 1812, she thought it was second only to July 4, 1776. Her vigorous denunciation of the British attracted many in her inn. When Decatur's Fleet scuttled into New London harbor in June 1813, everyone believed the British would attack again. The people fled to the back country. Mrs. Bailey sent away her household goods and prepared to follow. Major Simeon Smith hastily manned Fort Griswold with his militia. In need of cartridges and flannel for wadding, he sent a messenger down the hill for flannel, but the village was deserted. The discouraged messenger met Mrs. Bailey and told her of his need. In a moment, she loosened her long flannel petticoat, stepped out of it, and presented it with a loud wish that the wadding would do its work well. Amused, bystanders saluted the daring gesture, for in 1813 ladies did not admit to wearing petticoats, much less remove them publicly. The messenger carried his prize to the fort, where it was received with cheers. Though the British did not attack, word of Mother Bailey's impulsive gift spread over the country. Newspapers hailed her as the war's greatest female patriot. Later, a stream of celebrities knocked at her Groton door: President Monroe in 1817, Lafayette in 1824, and in 1833, President Andrew Jackson and Martin Van Buren. As her fame increased, visitors flocked to the tavern to hear the lively tale told from her own lips. She was as good as a floor show, dancing about the room, singing patriotic tunes and railing the British." On January 19, 1851, as Mother Bailey snoozed in an armchair near an open hearth, her clothes caught fire and she died within an hour at age 93. Her only survivors were cousins, for her title of mother was purely honorary. However, her name is remembered by the Anna Warner Bailey Chapter, NSDAR. 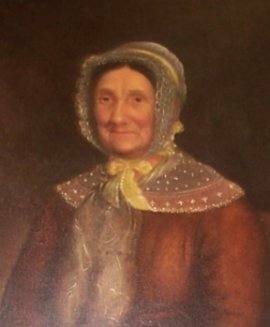 In their monument house museum, is her portrait (above), showing a stern elderly lady wearing a demure white cap and collar. But isn't there a gleam in her eye? Note: Carol Kimball kindly gave her permission to publish this article on the Internet. Not only was she an active member of the Anna Warner Bailey Chapter, NSDAR, she also served as the Groton Historian.